My stint as a soccer mom has been a lengthy one. It’s been seventeen years now, and judging rom the heart that my youngest pours into each match, it’s a sure thing the era will extend at least five more years. Today however, one chapter of this soccer mom’s story is quietly closing as my daughter Sarah takes to the pitch one last time for Ashland. Fast, hard-working, fearless, and focused. These have been my middle soccer child’s defining qualities right from the start. 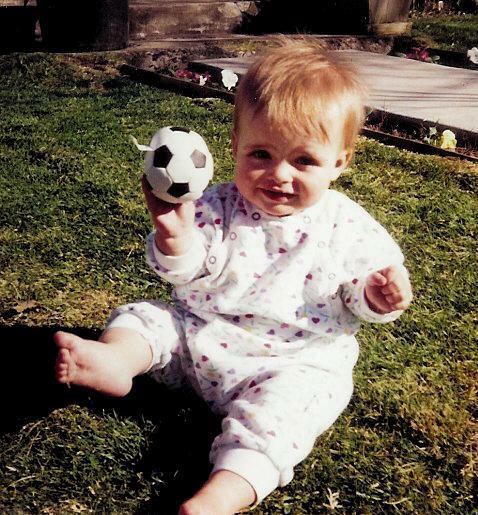 Sarah began at four years old playing YMCA soccer with her first coaches, Kim Keoppen and Joni Toth. We watched in delight as our little girls (with team names like “The Purple Unicorns”) ran down short fields holding hands and collapsed into puppy heaps after goals were scored into very tiny nets. They learned quickly and grew gracefully. Sarah loved it all and wanted to play everywhere: forward, midfield, sweeper, goalkeeper; in rain, heat, freezing sleet and fog; through mud holes and potholes, as many days of the week as possible. At nine she tried out for her first competitive soccer team, and Coach Aidan Jones picked the youngest kid trying out to join Team Stampede. “She’s fast,” he told me when he called to tell us the good news, “And yes, she’s smaller than the rest of them, but that doesn’t seem to hold her back.” In one fateful match, Sarah repeatedly made foot-on-the-line throw in errors during the first half. Determined to teach her to never EVER commit a throw in turn over again, Coach made her sit out the entire second half of the game and practice throw in’s on an adjacent field. By game’s end, she was as angry as I’ve ever seen her in a soccer uniform. I made Sarah talk to Aidan and remember watching her anger turn to laughter as the two of them hashed it out. Aidan loved Sarah’s willingness to do anything without argument or whining, and she loved the joy, team spirit and incredible work ethic he taught her – along with the nickname he bestowed (which hangs on to this day): Froggy. Her last few seasons of play with the Ashland Soccer Club were coached by Judd Pindell, and it was on this team that Sarah reconnected with some of the old Purple Unicorn gang. Traveling to tournaments together, learning to be a team – not just in relation to the ball and net – but also to each other, and playing the beautiful game with one’s old friends is the best of many worlds. They were all on the brink of changes at this juncture, as some girls would continue to play soccer together in high school, but a handful would choose other endeavors. Today, as I reflect on her high school soccer career, I know that it’s been an essential part of her becoming an adult. As a freshman – and during a very difficult time for our family –Froggy had the love, support (and happy return) of Coach Jones who was her JV coach. Tough summer conditioning and a bit of nail-biting helped her land a spot on the varsity squad as a sophomore, and she kept working hard. She connected with older players on and off the pitch: Katelyn Walker and Riley Smith were teammate role models for Sarah, and they taught her that encouragement from a respected peer is priceless. Coach Dana Yearsley has been a positive inspiration to Sarah throughout high school, and of course her varsity coach for three years, Eric Wolff has taught her much: how to focus on being her own best athlete, how to keep a winning attitude, and to remember that it’s your teammates and the experience that counts most – not the final score. Since I’m naming names (and please forgive me if my memory has left anyone off the roster), summer camps with Eisa Tiaa tutu were a source of great learning for Sarah, pick up matches and mentoring from Brad Roupp have been invigorating and fun (isn’t that what it’s supposed to be about?! ), and Karl Kemper pep talking her from the sidelines has always made her smile. Being sandwiched in between a long-legged, able to get down the field in four strides, fullback playing older brother and a roadrunner-like, scrappy, rough and tumble striker striking younger sister has also given Sarah a part of her fire. Soccer siblings teach each other many things, and my kids have often been one another’s final source of coaching at the end of many a match-filled weekend. So, I guess that’s it. I’m going to miss watching her play. Sarah has grown to be a presence of positive athleticism on the soccer field; she’s quick and gracefully fluid, always engaging, present in the moment, and she has had more assists than goals in her career (a statistic that I am very proud of). She’s never confused her tremendous love of the soccer with some wild-eyed little girl’s notion that she was going to be the next Mia or Abby. She respects them and the game, but Sarah is ready to redirect the energy spent practicing and playing to the next phase of her life. I have no doubt that all she’s learned these last thirteen soccer-filled years – from coaches, competitors, teammates and herself – will continue to guide her along the way. Varsity players dress for school pride on game days. She’s got it! This entry was posted in Siftings and Essays of the Heart and tagged Ashland, Ashland Soccer Club, Coaching, Soccer, soccer mom, the beautiful game. Bookmark the permalink.